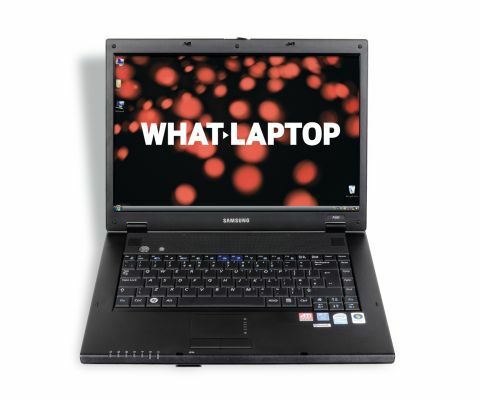 Samsung has overhauled its range of late but the Samsung P500 (£389 inc. VAT) retains the older basic design. The body is made from plastic that has a matt black ﬁnish. It's a simple design, with just a power button and single quick access key sitting above the keyboard, and a row of LED activity lights below. The build quality is more than satisfactory with plenty of protection behind the screen and solid hinges holding the 15.4-inch screen in place. The display is a standard TFT panel, so you won't ﬁnd images as sharp or as bright as a Super-TFT screen when editing photos or watching DVDs. That said, we found it a crisp and bright screen with an even tone across its width. When using this laptop out and about, the matt ﬁnish to the screen means fewer reﬂections are cast and we found it practical to use on a train, for example. Weighing 2.7kg, this compact model is a reasonably portable machine that is only limited by its battery life. Under test conditions the P500 lasted for 157 minutes, which is less than ideal for carrying around with you on a regular basis. The keyboard ﬁlls most of the main body of the laptop and the keys are individually mounted. They are ﬁrmly attached and have a reasonable amount of travel. The touchpad and mouse keys are also black and, in some situations, can be tricky to see. However, they are of a good size and proved accurate. When it comes to performance, you'll ﬁnd an Intel Celeron M 540 processor onboard, which offered the low benchmark score of 93. With only 1024MB of memory, you'll ﬁnd this machine is better suited running Windows XP than Vista, but a choice is available. Rounding out the main speciﬁcation is a 120GB hard drive. At this price point, you won't ﬁnd much in the way of extra features. However, there is the standard array of ports. The DVD rewriter is the sole device on the right-hand side and the left-hand side is limited to a single USB port, ExpressCard slot and VGA-out port. This is due to a large vent for the fan, which helps to keep the laptop cool when running for longer periods. In use we found it a reasonable machine and it offers decent if not outstanding value for the asking price.